Instead of the URL negotiation settings configured with languages, they are now housed where they are used, within the detection and selection configuration options. You can configure paths and domains here and even see nice complete URLs of how your site languages will be accessible. (We also took great care to make changes in site defaults properly update URL prefixes when configured, keeping existing paths as appropriate). The user system can now store up to three different languages associated with a user. The user profile language, the user's preferred language and (for admin users) the preferred language for administration (see below). 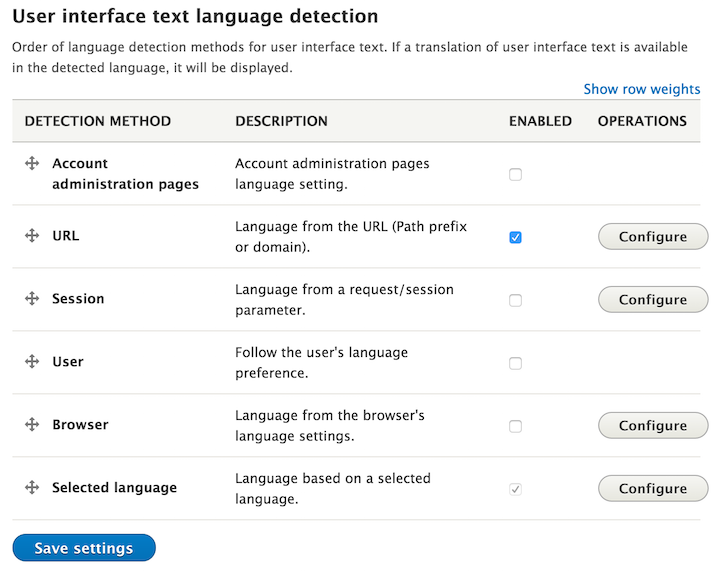 By default, users will only see one preferred language option to configure, but for sites with a need to differentiate user profile content language information from user preferred language, that is possible in Drupal 8 with some altering. There are no changes to the configuration of this option as exposed by Drupal core by default. The algorithms used for browser language detection are highly improved, and now Drupal understands that the language codes it uses may not be what other systems use in the world. 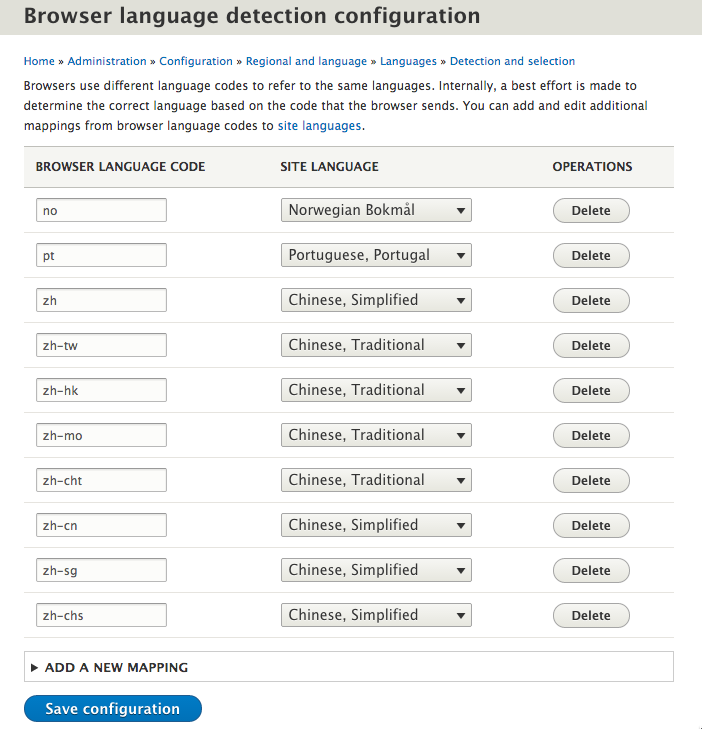 So there is an outside-inside language mapping table that lets you configure which browser configurations map to which internal languages. The mapping shown on this screenshot is what is shipped with Drupal by default. Other uses of this feature may be implemented in contrib. 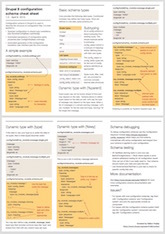 There is a module called Administration language available for Drupal 6 and 7. That module allows one global administration language to be specified for the site. On the other hand a new built-in feature in Drupal 8 exposes a per-account setting for each account with access to the administrative backend to provide a preferred language for the backend if desired. If you want to use this feature, it is suggested you place it as the first option above the URL detection method. That way, the normal URL detection can kick in for frontend paths, while the admin language takes precedence when on the admin backend. The user preference in account editing for the admin language will only be present if this option is enabled and only for users with access to the admin backend. 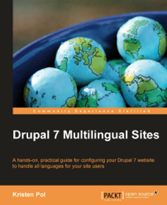 In Drupal 7, the last item in the list was the Default language option, so sites would fall back to the site global default language configured elsewhere. This made many people change the site default language when they intended to change how the site picked the page language by default. Changing the default language had numerous other unintended side effects as for example one of the commenters noted on my previous tidbit. So Drupal 8 makes this configurable. While it works with the site default language originally, it can be changed to any of the configured languages. No need to change the site default language anymore! This feature is implemented in the Fallback language negotiation module on Drupal 7, if you need this functionality now. Contributed modules can still add more options here using our APIs, but with the vastly expanded features, there will be less of a need to do so in Drupal 8. DONE! When content translation module is enabled, a content language negotiation option set is also made available. Two corresponding blocks are then exposed for language switching. However, on most sites, the two would be the same, so we should only expose the additional complexity when needed. See http://drupal.org/node/1833022 for an issue that is getting pretty close to resolve this. It would be great if you could give a more explanatory description of the language fallback works. For me this is mostly important for site users (visitors) and thus a content issue. Since Drupal is able to use different human readable URL's for translated pages, this is not generally a problem for pages users land on. However, for things like teasers, and Views lists, its a whole different matter. If an item there isn't available in the users current/preferred language, then it should optionally include the default language item. For D7, core does this, but unfortunately Views, last time I experimented with it, has no support for it. How will this change for Drupal 8? Will Views fully support this? Will it be possible to more granular control of it, such as select what languages to include in the fallback and the order they will be checked? Also, will it be possible for users to override the default and define their own fallback languages/order? This is not possible in core, but it may be possible in contrib if only TranslationLanguageRenderer::preRender() would pass on some unique views environment identifier string to entity view. That would let contrib to do custom language fallback for views specifically. If the view name itself is also passed on, it may be made configurable per view as well. A core issue would be useful to track this request. What should be the best practice for a website which delivers content in Dutch and French but admins would like to have the administration pages in English. So far, I have 3 languages enabled (Dutch, French and English) and have set English as my preferred language for the backend. Dutch is the default language. Is there a way to avoid that people make content in English? Thanks for your work. As Belgians (country with 2 languages) we appreciate the hard work which is delivered on Drupal 8 Multilingual. So in short, no not available in core. Yes, could be possible in a contributed module (and may eventually end up in core). I have a requirement for using some path prefix along with domains. For example: example.com and example.cn are server aliases. This is not possible to configure in core. It is an either or situation. However, you can write your own language negotiator plugin and implement this reusing the logic in the existing domain/path negotiator plugin. 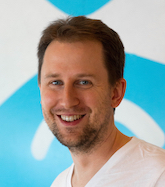 @ Gaurav have you implemented this idea from Gabor? I'm very interested in learning whether you wrote a "language negotiator plugin," and what that might look like, thanks! I can't find any way to disable language fallback in D8 and instead show a message like "Español translation unavailable" with links to the available translations. Any possibility to archive that? A contributed module could do that. It is not currently possible in core. Where can I enable the administration language feature in Drupal 8? And is it possible to set a default language (not english)? I don't want to have a translated interface when I edit a content translation. You can enable the administration language feature at the language negotiations settings, go to the language list and hit the selection and detection tab. After that, the specific admin language is a per user setting. Thank you. In addition I set the option "Customize Content language detection to differ from Interface text language detection settings" where the "Account administration pages language setting." is not active. Otherwise I have problems to translate content (e.g. get English content even though I wan't to edit the German translation). I installed Drupal 8 in English then I added Spanish and go to configure the path prefix. 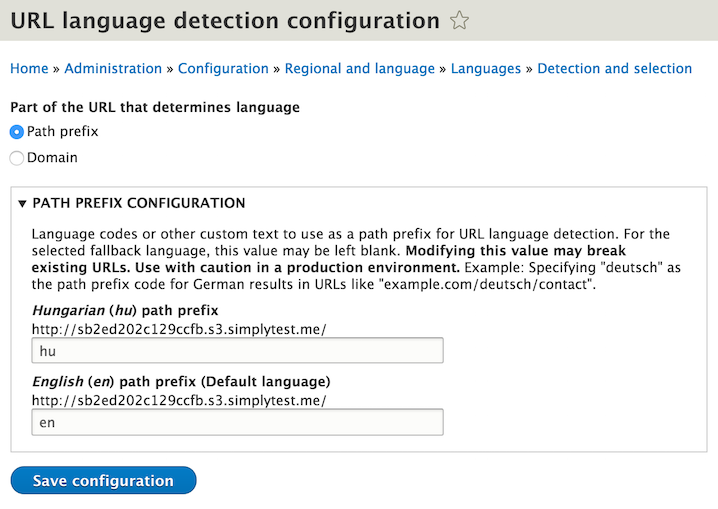 Drupal show me English(the default language) without path prefix, but Spanish have "es" prefix. Is this the recommended way? Or Do you suggest to put "en" for english? The reason Drupal does this is you already had an English site without a path prefix. So you may have had visitors, search engines may have indexed you, etc. So keeping the English path prefix as empty keeps your existing URLs as-is. If it would change the prefix, your existing URLs would break. You have the choice to configure it differently of course if you want to, just keep the consequences in mind. (There is no language URL redirection feature in core as of now). Is it possible to use different language detection system for Administration. Core does not support that given that admin language is not an entirely different language type but rather a negotiation option that you can enable, so that does not have an effect on whether URL negotiation is based on the path or domain for example. A contributed module could add a new language type to support this. How about if I want to use a combination of domain selection and prefix? That seems like a reasonably common scenario. Is it supported out of the box? No, but you can use a language negotiator plugin (module) to do this. Drupal core is extensible this way even if this scenario is not supported out of the box. There may or may not be a contributed module on drupal.org already that does this. It's stated that "... the normal URL detection can kick in for frontend paths, while the admin language takes precedence when on the admin backend..." yet the administration language fallback also seems to affect the frontend?